The HSR-2645CRH servo is a fully proportional, high torque digital servo that is like no other servo on the market. 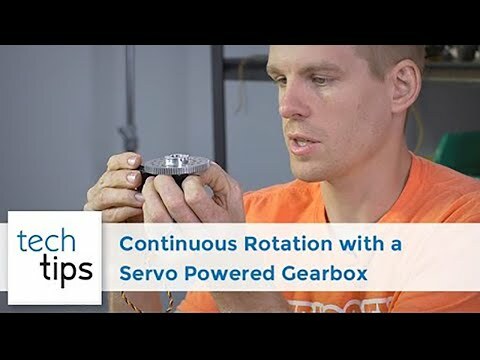 While most servos go to a specific location based on the signal received, the HSR-2645CRH servo rotates at a specific speed based on that signal. Its speed is fully proportional meaning that the further the signal deviates from the center (1500usec), the faster the servo will rotate. While regular servos that get modified to continuous rotation tend to be difficult to control the speed on, the HSR-2645CRH circuit was designed from the factory to drive the servo smoothly and with fine-control over the speed. Since the HSR-2645CRH servo is digital, it's able to be tuned using a Hitec servo programmer. The programmable parameters allow you to tailor the servo to best-fit your application. Excellent for compact sliders, winch mechanisms, small panning devices and wheel-drives on robots.